If you’re thinking of a move to another country, one of the important things to consider is how your disposable income will be affected. Of course, much of this boils down to taxes. KPMG provide a very useful online tax comparison tool, where you can pick and compare up to 4 countries at one go. 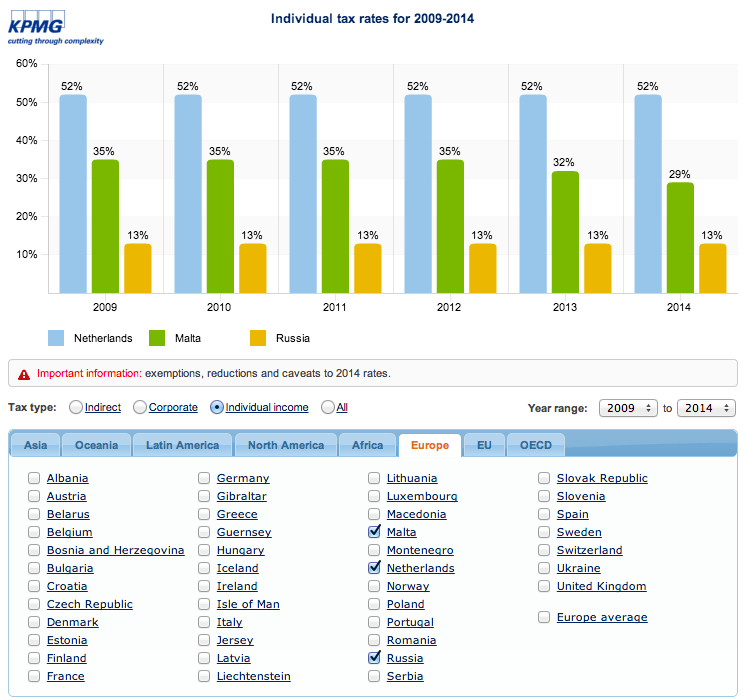 I was surprised to see that Spain and Italy have such high taxes, while the Russian rate looks impossibly low. This looks familiar lol 🙂 By the way another “financial” factor to consider as well when moving abroad is the possibilities where you can spend your money. This might sound funny or obvious but while some countries have very low taxes, the quality of life is not so good hence you won’t be benefiting from the extra disposable cash. For example in Albania both corporate and income tax is capped at 10%. That is a tax haven for us but still you cannot enjoy your money as much as you can enjoy it in Holland or Germany. Yes that’s a very valid thought Robert, it’s important to keep that in mind, because while you might be saving tax within the tax haven, you will still be taxed when getting the money out and into your home country for spending.